If your swingarm gets sloppy or decides not to pivot, it’s time for a rebuild with the Pivot Works Swing Arm Bearing Kit. With this kit you get all the bushings, seals, bearings, and spacers you need to completely replace the worn out hardware in your swingarm. Once you have everything lubed and back together, you’ll be ready to get back on the trail with a buttery smooth swingarm pivot thanks to the precision, quality, and ease of the Pivot Works Swing Arm Bearing Kit. Great product and fit. Even came with grease. Revived my bikes suspension and performance. Amazing how much better it is now. Kit itself is nice, but since it replaces plastic bushings with needle bearings, some instructions or just a parts diagram would have been nice. Pivot works doesn't even have instructions on their website, just a video showing how to do a normal bike's bearings. I installed the seals wrong the first time since there's 4 bearings in 2 positions, and almost lost my needle bearings trying to get them out to install them in the correct position. Stay away from this POS, who wants loose needle bearings to fight. Save time and frustration and buy OEM. All of the components look like quality parts. All metal parts had a light oil on them to keep them from rusting so that’s nice. It also included grease which is a bonus. About 6 months ago I replaced the lower linkage bearings on my kids 2007 CRF250R with a Pivot Works kit, which went very well. Decided to do the swing arm bearings as they probably original with this kit. Kit has everything you need to do the job including grease. A bench vise and sockets is all we used. Its a bearing kit and it comes with lube. Nice! Fits just like factory. Use these in my CR250 and CRF450. No problems. Great fitment as advertised. The parts were correct per design and were easily installed. I will use these again next time. 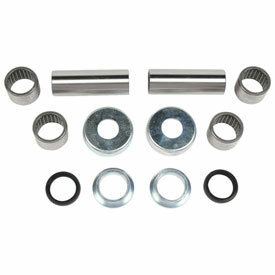 Everything you need to redo your bearing in your swing arm, comes with grease too. For the price this tool was an easy job. Pressed out all old bearings pressed new ones in. No need to look around for diff size sockets. Then losing them. Seems to work well. Easy to install. Package I received didn’t have my make and model printed on the label, but it did fit. The seals were different from the factory parts and were more difficult to install. Recommend that the factory parts be better duplicated to allow for easier assembly. Used them for a couple years now and they are a really great product! Everything fits like it should. Quality appeared to be good. Glad i put them in. Can't rate longevity yet. Great fit, great value, and quality product. zero complaints. Perfect fit for 2013 yz 250 two stroke. I use pivot works for all bearing needs and have never had a problem. Also comes with grease tube. These seem to be very high quality OEM replacements. Everything fits great and they supplied everything you needed including some waterproof grease. Bought this during a full rebuild of my 01 cr250. Looks to be of good quality and fitment was perfect. It seems good going in, but anything was better than the rusted out disaster I pulled out of there. Only time will tell how long it will last. This is for my spare bike so I'm expecting it to last a long time. Pivotworks bearings always fit and preform as well as or better than one at a lower cost. Good quality parts for a unbeatable price!! Really like that they send grease for the bearings with the kit. The only complaint would be to have a complete kits in stead of buying separate kits for each part. Like the shock,linkage,and swingarm. They went in as they should and appear to be of good quality. Havent had much ride time on them. I like that the kit even includes the necessary grease. Like a new bike! Great quality everything fit like it should! Seems like quality bearings and seals, and they were easy to install. These fit and performed as expected. I will recommend these to others in the future. Since I bought a used 2005 KTM I have been going through her checking up on her bits to make sure she's good for the trail. I have replaced many of her bearings with Pivot Works products and I haven't been disappointed yet. They work well, come with everything needed for install, and fit great. You won't be disappointed with their products and I do like their warranty. Two thumbs up. When you remove your swing arm the bearings are normally stiff with no movement this helps renewing it and with new pivot bolt installations on Honda's ex models and r.
best bearings made hands down!! enough said. This kit had everything that I needed to replace the falling apart, rusty bearings in my KLX 300 swingarm. Looks like it will do the job for a long time, especially if I remember to clean and regrease them at regular intervals (which I forgot to do with the originals). I was dreading having to order multiple parts/pieces to replace the used up swingarm bearings in my dads machine. then i found this kit which had every piece i needed and only one part number! Not quite as robust as the OEM. Have ran for 3 seasons without issue. Install was good. You can always count on pivot works to send out a quality product. Been running Pivot Works bearing for years and they never let me down, and a LIFETIME replacement is awesome, just remember to Lube them before assembly. I rebuilt my front and rear suspension with pivot works kits as well as my linkage, swingarm, and steering. Awesome products at good prices. bought this kit to replace my worn out oem pivot bearings after 6 years, 36 races and much abusive trail riding. I will not be purchasing any other pivot works products after this weak performance. I know they have a lifetime warranty but I don't want to constantly change parts, I want a good part that will last an acceptable amount of time. Everything I needed to get the Job done. With my MSR tool it went smooth. These bearings fit my bike perfectly, pressed in well and are smooth as butter. I have 1 full season on this with no issues what so ever. As with all bearing maintenance is key, clean and grease each season and they should last a long time. 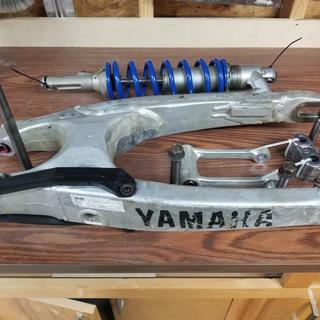 Is this top or bottom swingarm? BEST ANSWER: It was for my Honda TRX 450ER pivot pin bearings on the swingarm. Ended up using one of the stock OEM ones I took out, one of the Pivot Works bearings didn't want to go in , and I didn't want to bust it up installing it. I got one for my yfz450. 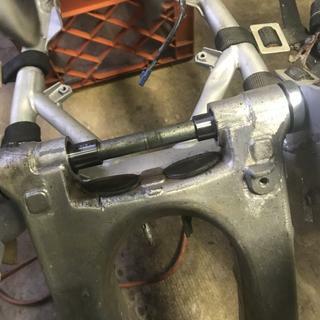 It replaces where the swing arm connects to the frame. Where the swing arm bolt goes through. Not the carrier bearings.. These bearing are for the swingarm, where the long bolt holds the swingarm to the frame. Bearings are good quality and not hard to install. I bought this for an XR650l, it came with both top and bottom. 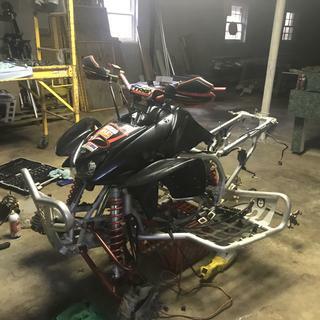 where the swing arm pivots on the frame. will this work on a 1998 yamaha banshee? BEST ANSWER: Yes it will but they are machine specific so here is the part # that you would need for your banshee. Part # 1021140030. Does this kit fot a 98 wr400?